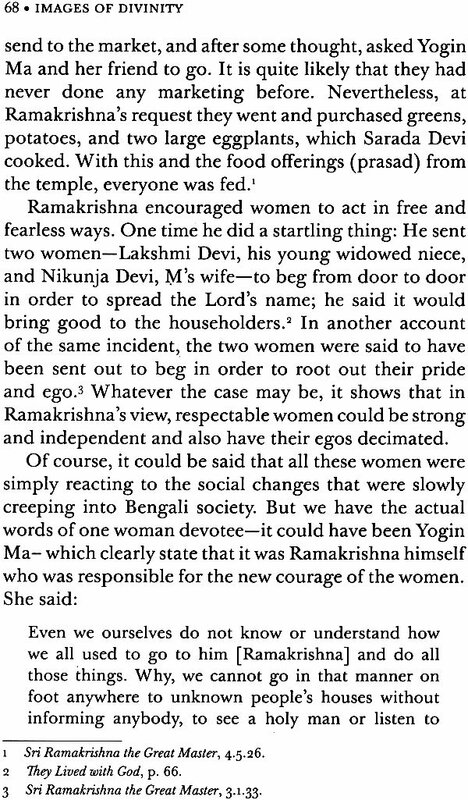 Images of Divinity: Sri Ramakrishna's Reverence for Women is an authentic account of recorded events in the life of Ramakrishna, one of the world's great spiritual masters, who lived in India between 1836 and 1886. 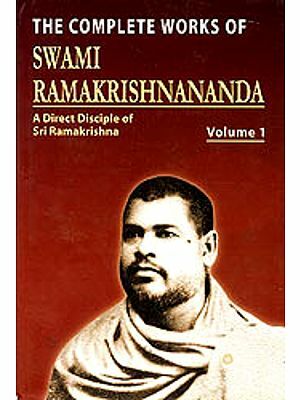 During the 19th century, India's spiritual currents were refreshed and replenished by Ramakrishna, who devoted himself steadfastly to attaining knowledge of God. He came to know divinity in many ways- through the disciplines of Hinduism, as well as through Christian and Muslim traditions. He is now believed by many to be an incarnation of God. Practising in the Hindu tradition, Ramakrishna first realized God in the form of the Divine Mother, Kali. In his first vision, he saw Her as an Impersonal manifestation, as a boundless. sea of light. Later he saw Her as an embodied form of the Divine Mother, a Personal manifestation. From that time forward, Ramakrishna saw himself as a child of the Divine Mother. Although Ramakrishna's sadhana (spiritual practice) continued with the realization of many forms of God, his relationship with the Divine Mother remained true. At the end of his period of intense spiritual practice, he passed on his wisdom to devotees of God who were high and low, rich and poor, men, women, and children. His life is a testimony to the value and power of the feminine. 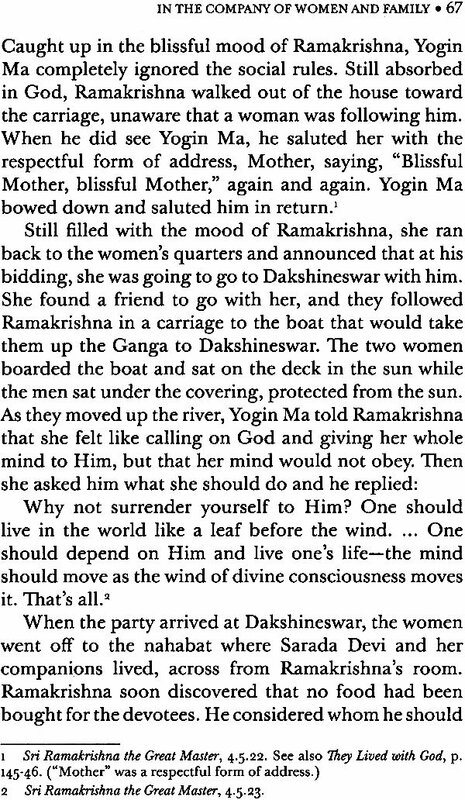 Ramakrishna worshipped the Divine Mother as the Creatrix of the universe, the embodiment of knowledge, his own mother, and the mother of all. To Ramakrishna, She was a living presence. We find revealed in Ramakrishna's life and attitude a bedrock of respect for women that rests on the reality of every individual woman as one with the Absolute. Women were recognized as the Mother Goddess, as the infinite Atman or Self, as beings worthy of the highest spiritual teachings, as partners in a great mission. Despite this worship of the feminine, one is forced to go beyond the limits of gender to the essential nature of woman and man and conclude that in no way, and under no circumstances, should a man or a woman be judged by gender. In the last analysis, gender must become irrelevant because it is irrelevant. Why, then, all this concentration on the feminine? Because only by understanding the innate divinity of the human being can women lead in creating a new society in which gender is neither a handicap nor a basis for special treatment. Ann Myren (1928-2012) was a woman of extraordinary concentration and determination from her earliest years. During her twenties, she had the great fortune to work for five years in California's Yosemite National Park, a stunningly beautiful region of mountains, forests, and great waterfalls, where she was the first woman in the state to become a certified ski instructor. The granite peaks, snow-fed streams, and pure mountain air remained her favorite environment throughout her life, and she returned many times with other Vedantists to hike and camp among the mountain lakes. In her early thirties, she was initiated into the Vedanta Society of Northern California by Swami Ashokananda. For more than four decades she taught in high school and college courses like American History, Psychology, and Women's Studies. Ann Myren was a co-founder of the Vivekananda Foundation and a co-editor of Living at the Source, a compendium of selected quotations of Swami Vivekananda. Others were inspired by her independence of spirit, initiative, and freedom of thought and expression. Ann was always ahead of the larger society's gradual and sometimes begrudging acknowledgment of the equal rights and abilities of women. One of her articles in the Sri Sarada Math publication Samvit was entitled, 'Hands Off! Women will Solve their own Problems'. As a steadfast student of Vedanta, Ann's insistence on equal opportunities for women was fueled by her unshakable faith in the essential divinity of everyone, beyond the dualities of gender. In her final years, Ann's considerable will and intellect were overtaken by physical illness, but this was accompanied by a great expansiveness of heart, a deep appreciation of kindness, and a radiantly peaceful acceptance of her transition from this world.